We would like to congratulate Jake Lawrence on his commitment to Trinity University! Here are Jake’s recruiting story and interview after his commitment. Good luck as a Tiger! The process was stressful as expected, but SportsForce, as well as my high school coaches, were very helpful in guiding me. I got exposure through team tournaments and showcases and started receiving attention my junior year. When I started playing varsity, I eventually received offers during the fall of my senior year. I decided between several Division 3, high academic universities and committed in February of my senior year. 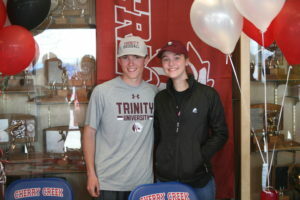 I chose Trinity University because it was a great combination of high-level baseball and quality academics. I also think very highly of the coaching staff and respected the players I met during my visit. I was fortunate that my high school program and coaches were able to help me get exposure. But Andrew and the SportsForce team helped me organize my reach out to coaches after showcases and, most importantly, helped prepare me to effectively communicate with coaches by having prepared answers to the typical things they ask as well as have questions ready for them. I don’t think I would have made a very good first impression without SportsForce’s help. Andrew also helped guide me in deciding which showcases would be the best to attend so that we didn’t waste a ton of money and time trying to go to all the ones I got invited to. I am very excited that I get to live my dream of playing college baseball. Trinity University is a great overall fit for me and I’m not sure I would have gotten there without baseball being part of the process and decision. Division 3 schools don’t give athletic scholarships but I did receive the academic Trustee’s Scholarship from Trinity for $22,000 per year or $88,000 for the full four years. I would recommend SportsForce because they helped me navigate the recruiting process which can be confusing, stressful and exhausting. They definitely helped find the right fit for me in terms of a baseball program and school. I appreciate all they did to help me and my family. This entry was posted on Wednesday, May 2nd, 2018 at 8:41 pm and is filed under Athlete of the Week, Baseball, College, Commitments, Commitments, High School, Inspiring Stories, Q & A, Recruiting. You can follow any responses to this entry through the RSS 2.0 feed. You can leave a response, or trackback from your own site.